This is the flag of the so-called Free Aceh Movement (GAM). In Sweden, they use the designation National Liberation Front of Aceh Sumatra (NLFAS). Similar names are used in other foreign countries. 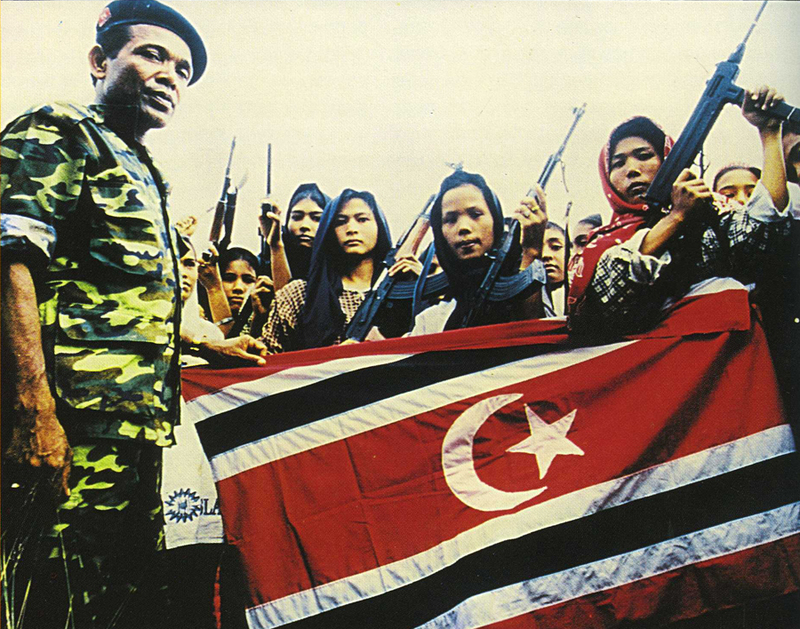 The GAM is a separatist movement in the northern Aceh province of Sumatra, and fought a decades-long guerilla war against several Indonesian governments. Today, GAM has been legalized and has presumably given up its demand for independence. On leaflets passed out by this group in Sweden during the 1980's, all of Sumatra was indicated as the sought-after independent state, but in practice, GAM or NLFAS were only active in Aceh and express the aspirations of the Acenehse people. In Sweden, GAM participated in the Social Democratic May Day marches, presumably because Indonesia had an authoritarian right-wing regime which many Social Democrats and leftists would have been critical towards. GAM is really Muslim-nationalist rather than leftist, and one of its main brokers at the time was Gaddafi's Libya, which mentioned the group prominently in its “World Mathaba” propaganda organ (the World Mathaba was an attempt to create a kind of pro-Libyan international). The flag of GAM is inspired by that of the old Aceh Sultanate, which in turn is a typically Muslim banner.